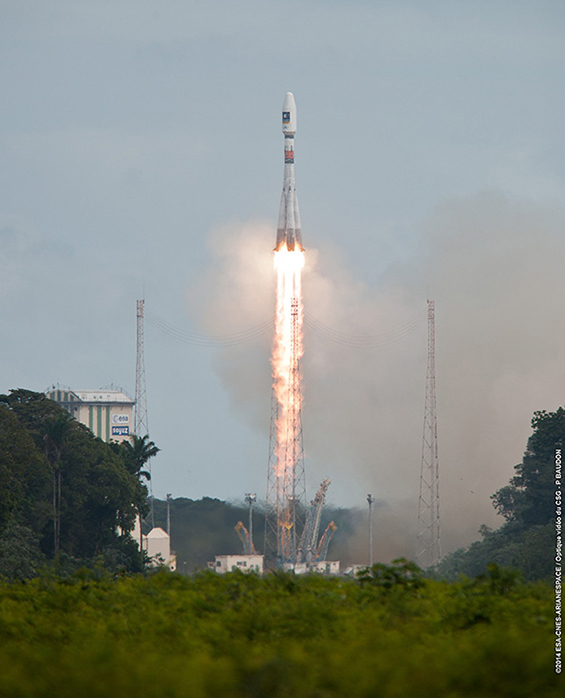 Arianespace’s workhorse Soyuz vehicle marked another “mission accomplished” from French Guiana today – lofting two milestone Galileo spacecraft – as the company once again supported the space ambitions of Europe. Lifting off from the Spaceport at precisely 9:27:11 a.m., the medium-lift Soyuz performed a successful mission of nearly 3 hours and 48 minutes to deploy “Doresa” and “Milena,” which are the first two FOC (Full Operational Capability) satellites for Europe’s Galileo navigation system. After an initial powered phase of Soyuz’ three lower stages, Flight VS09 included two burns of the Fregat upper stage – separated by a three-plus-hour ballistic phase – to place these two 730 kg. Galileo satellites at their targeted deployment point. At full deployment, the Galileo program will provide a European-operated navigation system to deliver highly accurate global positioning services through a satellite constellation in medium Earth orbit – and associated ground infrastructure. The European Commission is funding and executing Galileo’s FOC phase, with the European Space Agency (ESA) designated as the system’s development and sourcing agent. Doresa and Milena – named after the respective German and Estonian winners of a European Commission children’s art competition – were built by prime-contractor OHB System of Germany, with the spacecraft’s navigation payloads supplied by the UK’s Surrey Satellite Technology Ltd.
During post-launch comments from the Spaceport, Arianespace Chairman and CEO Stéphane Israël said today’s mission to support the development of this civilian-controlled navigation system reaffirms the company’s “raison d’être:” providing Europe and its institutions with independent access to space. “Arianespace and Soyuz have now provided new momentum to the Galileo constellation with the launch of the first two Full Operational Capability satellites,” Israël added. The successful Flight VS09 mission continues the key role of Arianespace – and Soyuz – in Galileo’s deployment. From the Spaceport, this medium-lift workhorse lofted a total of four satellites in the program’s IOV (In-Orbit Validation) phase in 2011 and 2012, plus the initial two FOC platforms orbited today, along with two GIOVE (Galileo In-Orbit Validation Element) satellites on separate flights operated in 2005 and 2008 by the company’s Starsem affiliate from Kazakhstan’s Baikonur Cosmodrome. Following a launch agreement signed this week at the Spaceport with ESA on the European Commission’s behalf, Arianespace will step up this navigation system’s deployment with 12 total satellites to be launched by three dedicated Ariane 5 ES vehicles from 2015 onwards. As a result, all 22 spacecraft in this FOC series will be orbited on eight Arianespace missions – covering five Soyuz flights with two satellites each (including today’s VS09 success, and another liftoff scheduled at the beginning of December); along with three Ariane 5 launches, carrying clusters of four Galileo spacecraft each. Along with Galileo, Arianespace’s contribution to Europe’s major space initiatives also includes the Copernicus Earth observation program, for which Soyuz lofted the first spacecraft – Sentinel-1A – in April of this year on Flight VS07. The company has also been selected to loft Sentinel-1B on a Soyuz flight from French Guiana scheduled for 2016. “I want to express my gratitude to the European Union and the European Commission for having chosen Arianespace as a key partner for its ambitious Copernicus and Galileo flagship space programs,” Israël said. Other Arianespace missions for Europe this year include July’s Ariane 5 heavy-lift flight with the fifth and final Automated Transfer Vehicle for servicing the International Space Station, and an upcoming light-lift Vega flight with ESA’s Intermediate eXperimental Vehicle (IXV), which is targeted for November. Following Flight VS09, Arianespace has now operated seven successful flights in 2014 across its complete launcher family. This year’s activity to date includes three Soyuz and Ariane 5 flights each, along with one mission performed by Vega. Announced following today’s launch, the company’s next mission – designated Ariane 5 Flight VA218 – is a targeted for a September 11 liftoff with two passengers: Malaysia-based MEASAT’s MEASAT-3b and the Optus 10 spacecraft for Australia’s Optus.